FAQ: Do I Need to Learn Guitar Scales? As soon as you progress beyond the beginner stages of learning guitar, and you hear more and more musicians talking about scales and modes, the inevitable question pops up, something along the lines of - do I need to learn guitar scales in order to become a decent player? This commonly asked question implies an awareness of the amount of work involved in mastering scales. At first glance, it can appear overwhelming. Many guitarists, understandably, want the easiest path possible to attain a decent level of competence with their instrument. Fine. In that case, no, you do not NEED to learn guitar scales. There are countless songs, even entire albums, which could have easily been written without any knowledge of scales. Just the other day I was listening to a relatively new artist, Darwin Deez - a prime example of an original, creative musician whose guitar based music requires zero scale knowledge. That's just one example of many musicians, old and new, whose creativity has clearly not been limited through lack of this knowledge (or at least an apparent lack of its use). But wait! Scales are not something you should be so hasty to dismiss. While it's true learning scales takes a fair amount of time and persistence, don't assume it's beyond your capability. Don't limit yourself unnecessarily. Don't overlook the benefits of learning them. Let's examine the likely outcomes of two types of guitarist - one who chooses to learn scales and another who chooses not to learn scales. You'll find it easier to create musical, fluid solos - Scales allow you to visualise a group of related intervals/notes in various positions on the fretboard, known as patterns. Once these patterns are committed to memory, they give you a road map for your solos, meaning there's less chance of wandering aimlessly into dissonance or hitting "bum" notes. You won't need to tread so cautiously around the guitar neck, as the scale will show you which notes are part of the implied harmony of a piece of music. Your improvisation skills will develop faster - Linked to the above point, knowing where to go on the fretboard will give you the confidence to create musical phrases on the fly. Scales are not a magic bullet for this, but knowing them certainly takes a lot of the time consuming trial and error out of creating phrases that "say" something meaningful. As time goes on, you'll find it easier to connect scales to their related chords and progressions. Speed & timing will come more easily - knowing where to go on the fretboard is half the battle when it comes to developing speed and good timing. Once you memorise a scale pattern and don't have to think too much about where to go, you can get to work on your muscle memory and developing physical confidence with moving from one note to the next, in time and at varying speeds. Scales help you see note relationships - As you learn scales, you soon realise they can be used as the scaffolding for building elements such as chord shapes and arpeggios. Many scales share common intervals, so you'll start to see common patterns occurring as you learn them. For example, a 1 3 5 major arpeggio can be found within several scales used over major chords. Similarly, that same relationship can be used to build major chord shapes, which leads naturally to understanding chord inversions - something that might seem too complex without that scaffolding to help you see them. Your lead technique will improve - While knowing scales won't make bending strings, legato, sweep picking, tapping and other lead guitar techniques physically any easier, it will help you apply them more intelligently in your solos. For example, if you know scales, you'll think "I can bend from the minor 3rd to the 4th" to create the expression you want. You'll know where to apply a hammer on/pull off. You'll have clear target notes for your bends and slides, meaning less guess work and less chance of... oops... hitting a bum note. You may as well sell your guitar and give up now - Just kidding. You'll gravitate towards rhythm playing - Scales are not essential for playing lead/solos, but it's true that without them, you'll gravitate more towards techniques that don't require that knowledge such as strumming and picking chords - the backbone of a lot of music. That doesn't mean you'll create inferior music - look at the funk genre as just one example of many - this was built around a strong emphasis on rhythm and groove, chunky chords and chord phrasing. No scale knowledge required there, just a good sense of timing, momentum and pick hand attack. You'll have more time to explore chords - Many guitarists spend so much time developing their knowledge of scales and lead technique, becoming exceptional soloists, but ask them to play a few chords and they'll resort back to those open position "cowboy chords" we learn as beginners. Nothing wrong with that as such, but there are so many beautiful, unusual and vibrant chord voicings to be discovered all over the guitar neck. 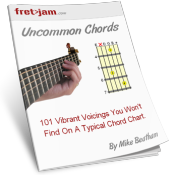 It takes just as much time to build your chord vocabulary as it does scales, and many guitarists find it difficult to manage their time for learning both. Inevitably, those who do try to learn both have to compromise somewhat. Focus 100% on chords, and your music can be just as spine tingling as the most epic solo, just in a different way. You'll focus more on writing songs, not solos - OK, that might be a slight generalisation! But as mentioned before, the backbone of a good song is often its chord progression, lyrics and vocal melody. While scales can be useful for embellishing melody in songs, many beautiful, heartfelt songs consist purely of chords and rhythm. All the melody can come from the vocals and other musicians with whom you collaborate (recommended). Your playing skills will be specialised - Specialising in a certain musical role, such as rhythm or lead, can help focus your craft as a musician. Don't feel like you have to master everything, because this can easily lead to becoming a "jack of all trades", which is not in of itself a terrible thing, but excelling in one particular style or technique can make you truly stand out from the crowd. You can still play an indispensable part in a band without knowing scales, or much theory for that matter. It's unlikely you'll audition yourself for the role of "lead guitarist" in a band if you don't know scales, but not every band is looking for that. Most bands simply want fresh, original ideas and that comes from somewhere much deeper than simply knowing scales. You will still be able to play lead! - It will perhaps just be more understated and based purely on what sounds right to the ear. Some music is more suited to linear, subtle melody. You may find this comes naturally, if you can hum a melody and find the notes on the fretboard by ear. For this reason, ear training is something I would recommend all musicians work on, and the good thing is it does indeed come naturally with time. I hope the above has given you some perspective on the need (or lack thereof) to learn scales to become a creative, skilled and respected guitarist. On a personal note, I chose to devote (a lot of) time to learning scales and theory, and I feel I'm a better musician because of it. But if I really think about it, in reality I've just become better at using scales! Without that knowledge I would have surely found other ways to express myself on guitar, and directed more of my energy into elements such as chords and rhythm playing (finger picking, for example, is one area I have neglected). My advice would always be to monitor your progress on guitar closely, in relation to your long term goals as a musician. If you at any point feel hungry for something new, to get those creative juices flowing again, try introducing scales into your practice time and see if they can offer you any fresh ideas. I guarantee they will add a new dimension to your playing. Unfortunately, too many guitarists learn a few scale patterns and then struggle to use them in a musical and meaningful way. There's more to learning scales than simply where to play them on the fretboard. For a proper head start with scales, I highly recommend the Guitar Scale Mastery course by Craig Bassett. Using his system will not only help you learn scales in less time, but it will also show you how to use them intelligently and creatively in your music. Whichever path you choose to take - scales or no scales, I wish you all the best in reaching your goals as a guitarist. Above all else, be yourself on guitar!